The former Fred Harvey restaurant as it looks today. Photo by Steve Hymon/Metro. On the occasion of Union Station’s 75th anniversary, Metro created a special commemorative publication, Union Station: 75 Years in the Heart of LA, featuring eight written and five photographic essays that celebrate the station by authors John C. Arroyo, William D. Estrada, Stephen Fried, Rafer Guzman, David Kipen, Marisela Norte, D. J. Waldie, and Alissa Walker. The book is on sale now at the online Metro Store. All essays will also be posted on The Source in the coming weeks. The series was edited by Linda Theung, an editor and writer based in Los Angeles. When the Southwest Chief pulls into L.A. after our overnight trip from Winslow, Arizona, it’s pretty early to be waking up in a train station. My wife and I tumble out of our sleeper compartment and, faces still as wrinkled as our clothes, drag our bags in uncaffeinated silence off the platform and into the cavernous waiting room—taking in what Jonah’s view might have been like if swallowed by a Mission Moderne Style whale. Fred Harvey postcard. From Appetite for America, courtesy of the Michael McMillan Collection. This particular door is all glass, like the forty-foot-high wall it’s part of, and we put our noses up against panes to try and get a better view of America’s last great railroad restaurant—and the crowning achievement in the career of landmark architect and designer Mary Colter, one of the few woman architects of that era. While her quirky tables—which, along with the booths, created all kinds of intimate corners in what would otherwise feel like an Art Deco plane hangar—are now long gone, the room still glistens with nostalgia and production values and promise. And the most ingenious part of her design—a cement tile floor that resembles a football-field sized Navajo rug—looks like it was just installed and buffed yesterday. 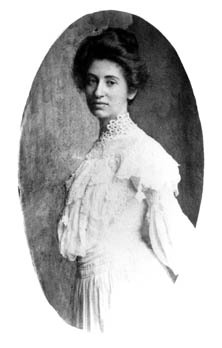 Fred Harvey company architect Mary Colter. From Appetite for America, courtesy of the Mary Larkin Smith Collection, Grand Canyon National Park. Many people who grew up in or were transplanted to Los Angeles don’t know the significance of this old Fred Harvey restaurant space—and if they know about it at all, it’s because they’ve been at a wedding or Bar Mitzvah here, as it has been rented out for events and movie locations for years awaiting its second act. But I’ve been seeing it in my head for years, as I sit in an office in Philadelphia writing the saga of Fred Harvey and his Western hospitality empire on the Atchison, Topeka & Santa Fe Railroad (aka “the Santa Fe”). The Fred Harvey system linked eighty cities and towns between the Great Lakes, the Gulf of Mexico, and the Pacific, but ultimately was famed for connecting Chicago and Los Angeles by rail in the decades before practical car and air travel. Fred Harvey was a British immigrant who worked for Midwestern railroads as a freight agent and then, at forty, in the mid-1870s, had a midlife crisis that changed American dining and hospitality forever. Harvey reasoned that if a railroad actually focused on offering excellent food and service it could beat out its competitors, and the best way to do that would be one company—the first national chain of anything—running the food-service operation centrally. He launched his idea in partnership with the Santa Fe in Kansas, and grew with the railroad as it expanded West, East and South. Oldest known printed Fred Harvey menu from first Harvey dining car, 1888. From Appetite for America, courtesy of the Jere Krakow Collection. As Fred Harvey’s operation became better known, the restaurants and their famous “Harvey Girl” waitresses—hired in Kansas City and Chicago and dispatched all over the Harvey system like culinary soldiers—became a cornerstone of Southern California’s growth. The original Fred Harvey restaurant in Los Angeles opened in 1893 at the Santa Fe’s original La Grande Station at Second and Santa Fe, now the heart of the Arts District. It grew in popularity and importance as L.A. did, especially as Hollywood became the winter home of the nascent motion-picture industry. Those early directors, writers, and actors all came to Los Angeles on Santa Fe trains—especially the California Limited and later the famous Super Chief. Starting in 1912, it became common for Santa Fe stations to double as locations, with directors Mack Sennett and D. W. Griffith shooting cowboy-and-Indian silent films at the Harvey Alvarado Hotel in Albuquerque. Later, the La Grande in L.A. became the setting for films starring Laurel and Hardy, James Cagney, and others (including, after it closed, Meet Me in St. Louis, with Judy Garland). While the Fred Harvey company was invented to take advantage of the lack of union stations and dining cars, it became synonymous with them starting in the mid-1890s. That’s when the Santa Fe added Fred Harvey diners across the system and St. Louis became the first of many major American cities to erect a modern union terminal—where the Harvey company was hired to run not only all the restaurants, but all the retail and services as well. Kansas City Union Station followed in 1914, Chicago Union Station in 1925, and Cleveland Union Station in 1930. 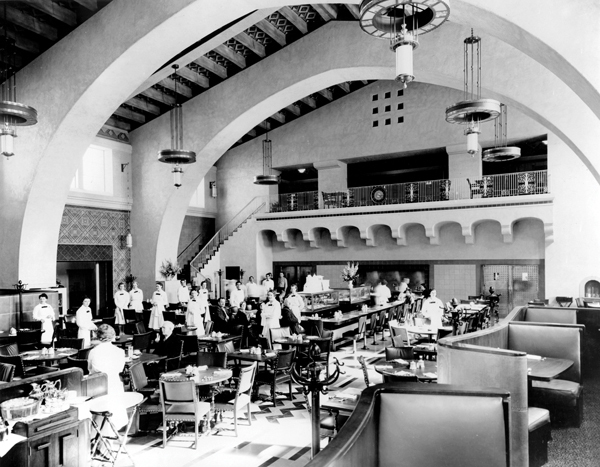 By the time Los Angeles started building its own Union Station in the 1930s, Fred Harvey’s restaurant network had been in existence for sixty years. Fred was long gone, and the family business was passing to a third generation in the midst of an economic downturn and the continued rise of automobile and air travel. 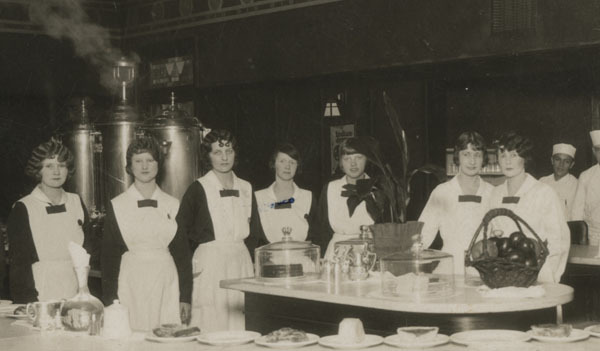 In the new station, the Fred Harvey restaurant was ready to open with its staff of Harvey Girls. Courtesy of the Los Angeles Railroad Heritage Foundation Collection. Photo by the Santa Fe Railway. Fred Harvey postcard of Chicago Union Station. From Appetite for America, courtesy of the Michael McMillan Collection. Lunchroom at Chicago Dearborn Station. From Appetite for America, courtesy of the Gordon Chappell Collection, Denver Public Library. 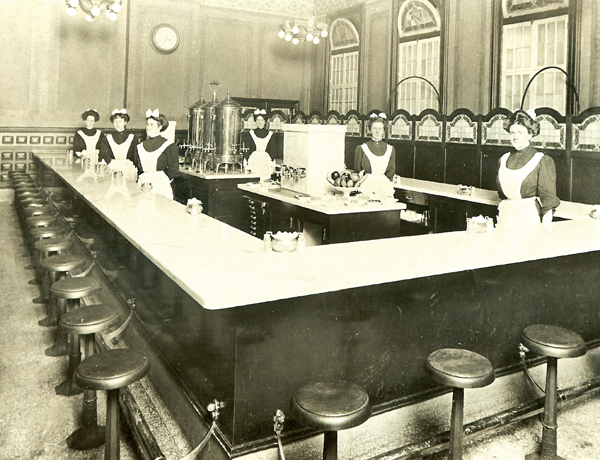 Harvey Girls at the original Dearborn Station in Chicago, before the city had a Union Station. From Appetite for America, courtesy of the Gordon Chappell Collection, Denver Public Library. Harvey Girls in Waynoka, OK, 1920s. From Appetite for America, courtesy of the Waynoka Historical Society. Fred Harvey bar seating today, looking much as it did when the station opened, minus the tables. As America entered WWII, the restaurant space served two distinct roles. Starlets still hid out and drank in the bar, locals still came for comfort food day and night, but periodically the main dining room had to be retrofitted to serve thousands of traveling military men at a time, while others were served Harvey bag meals through the windows of their crowded troop trains. 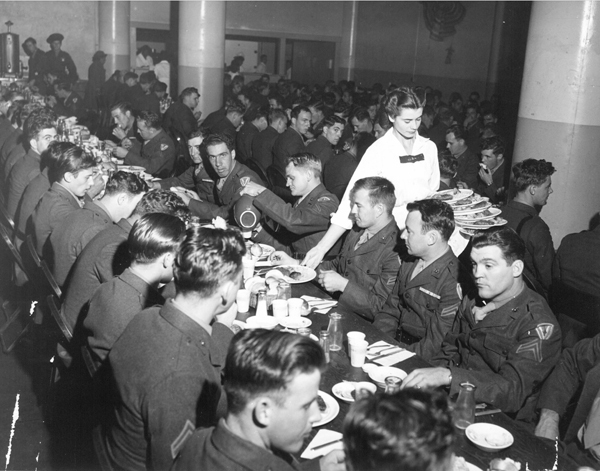 Soldiers crowding then-new Los Angeles Union Station’s Fred Harvey restaurant during the WWII years. From Appetite for America, courtesy of the Kansas State Historical Society. The peak of the love affair between the Fred Harvey restaurant and Los Angeles came in 1945, when a musical of the company’s story, The Harvey Girls, was filmed in Hollywood starring Judy Garland, Ray Bolger, and Angela Lansbury. After filming wrapped in May, Garland married Vincent Minnelli, and the couple was whisked away to the Super Chief heading east. They spent their first night married in Santa Fe private car 181, being taken care of by Fred Harvey employees who had been deluged with memos about the consequences of any “slip-up” in service. The movie opened to huge success in January of 1946, with life-size cutouts of Judy Garland as a Harvey Girl in union stations across the nation. Judy Garland in the 1945 movie musical, The Harvey Girls. From Appetite for America, courtesy of the Michael McMillan Collection. 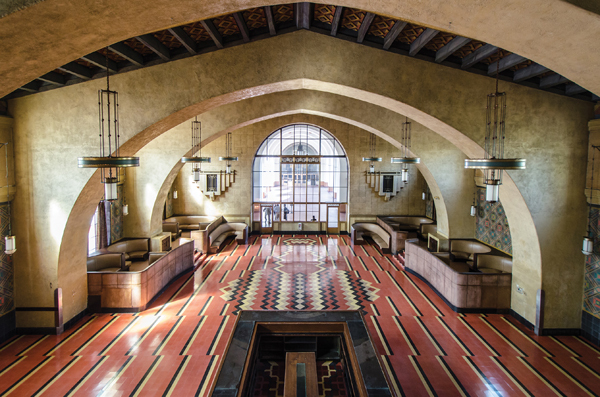 While Fred Harvey, the railroads, and L.A. Union Station hoped the film, and the end of the war, might help create new interest in the romance of rail travel, the late 1940s marked the beginning of a reduced role for passenger trains and stations. 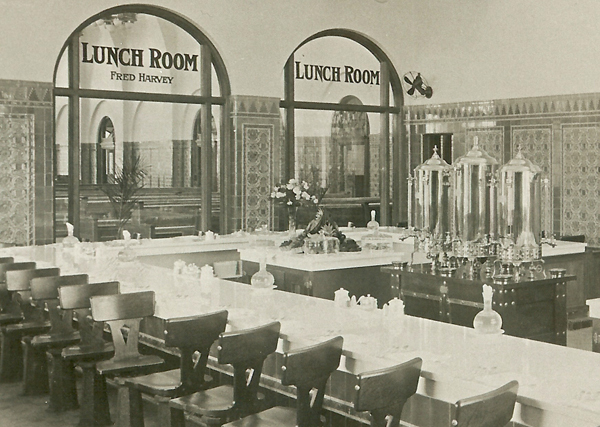 The Fred Harvey restaurant at Union Station continued to serve excellent meals from a menu combining perfect American comfort food prepared with local ingredients and various ethnic and international dishes, from chicken cacciatore to French apple pie with nutmeg sauce (see below) until 1967, when the company was sold by Fred Harvey’s great-grandchildren. Since then it has been almost everything but a restaurant: a set for anything from Blade Runner to a Jonas Brothers video, and a setting for almost as many rites of passage as were celebrated there when the Fred Harvey restaurant was still a center of Los Angeles life. As its seventy-fifth birthday approaches, and the neighborhood around the station has made a great comeback, it seems more likely than ever that it could be a restaurant worthy of Fred Harvey again. There are actually still three of them in operation—the ones at El Tovar at the Grand Canyon and La Fonda in Santa Fe, New Mexico have remained in business continuously since their openings in 1905 and 1926 respectively, while a couple from Los Angeles, Allan Affeldt and Tina Mion, saved the Harvey hotel in Winslow, Arizona, La Posada, where former L.A. chef John Sharpe currently runs the outstanding Turquoise Room. And, one day soon, I expect my wife and I will walk up to that glass door, peer through, and see the delicious second coming of the Los Angeles Fred Harvey restaurant. I hope we’ll be able to get a table. Below is an original Fred Harvey recipe from Los Angeles Union Station, created by head baker Henry C. Ibsch, who immigrated from Germany in 1923. 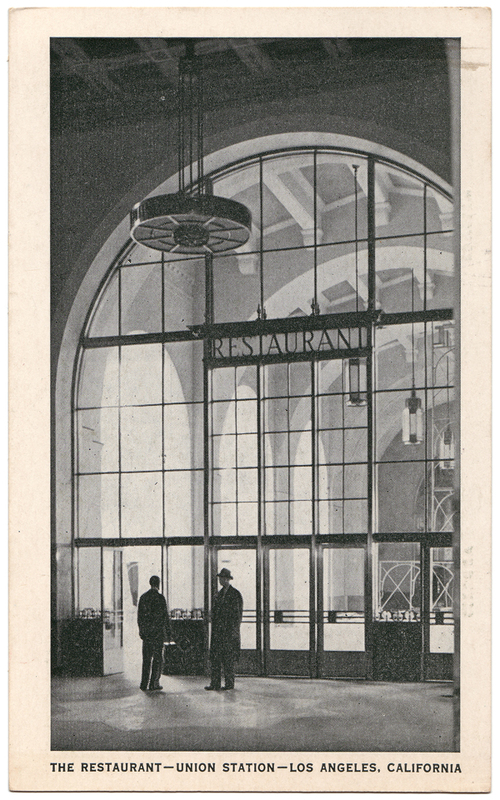 Ibsch worked first at the Fred Harvey restaurant at the La Grande Station before transferring to the new Union Station in 1939. Pare and slice eight cups tart apples and place in the saucepan with one-half cup water to cover. Bring to a boil and cook until tender, about five minutes. Add one-half cup sugar, mixing gently to avoid damaging apples. Using slotted spoon, arrange apples in pie tin lined with pastry. In a small bowl, stir to mix one cup graham cracker crumbs, one-half cup flour, and one-half cup sugar. Add one-third cup butter and a few drops vanilla and stir thoroughly with a fork until mixture has a coarse, crumbly texture. Sprinkle the graham cracker topping evenly over apples. Place in oven preheated to four-hundred-fifty degrees for ten minutes, then reduce temperature to three-fifty degrees and bake for thirty minutes, or until pastry turns light brown. Nutmeg sauce: In small saucepan, beat one egg yolk, one-half cup sugar, and one cup milk together well. Heat to just boiling and remove from heat immediately. Add one teaspoon nutmeg and stir thoroughly. Stephen Fried is an award-winning investigative journalist and essayist, and the author of Thing of Beauty: The Tragedy of Supermodel Gia, Bitter Pills: Inside the Hazardous World of Legal Drugs, The New Rabbi and, most recently, Appetite for America: Fred Harvey and the Business of Civilizing the Wild West—One Meal at a Time. He teaches non-fiction writing at Columbia University Graduate School of Journalism and the University of Pennsylvania. Fried is too modest – he should mention his wonderful book: Appetite for America: Fred Harvey and the Business of Civilizing the Wild West–One Meal at a Time. Another knock-your-socks-off Deco-era railroad station is the former Omaha Union Station (now the excellent Durham Museum). It has an equally impressive former restaurant space that is now a gallery of the museum. I was 14 years old in 1959 when I stepped off Santa Fe’s EL CAPITAN at the magnificent LAUPT to begin my new life in LA. I was greeted by my father then walked through a beautiful patio bursting with colorful flowers and tropical plants to the Fred Harvey coffee shop where my stepmother was having her Sunday morning coffee. I had already sampled delicious Fred Harvey meals in the Hi-Level dining car.